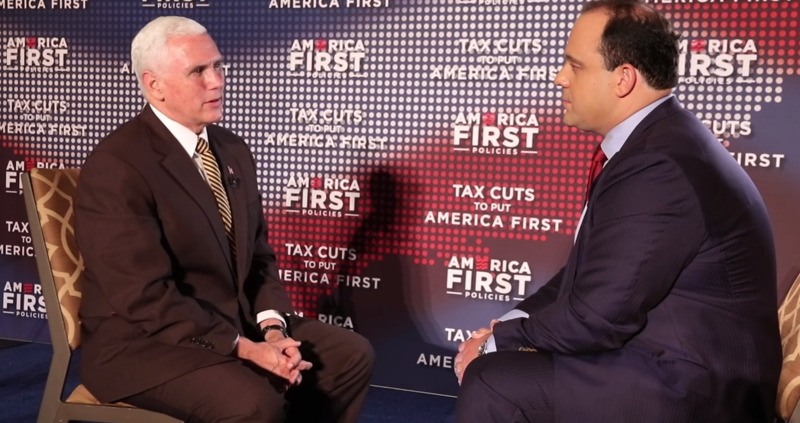 The latest “Bottom Line With Boris” segment, posted online today , is another excerpt from Sinclair chief political analyst Boris Epshteyn’s recent exclusive interview  with Pence. The roughly 90-second segment is mostly Pence just listing what he calls the administration’s “record of success." Epshteyn does not ask a question in the clip, but does nod along in agreement. BORIS EPSHTEYN: The relationship between the White House and most of the media is anything but productive. I recently sat down with Vice President Mike Pence to discuss how the administration is treated by the press. Here’s what he said. MIKE PENCE: You know, I've always said that if you're in public life, criticism comes with the territory. But I have to tell you, it is striking to me some days when I see the way the media is critical of this president. I mean, think of what we've accomplished in just a year and a half. We’re rebuilding our military. We’ve strengthened international alliances. NATO is now contributing more than ever before to our common defense. The president stood strong against the regime in North Korea and now North Korea is no longer testing ballistic missiles or nuclear weapons and has come to the peace table. At home, the president's cut taxes across the board, rolled back federal regulation and the economy has taken off, and we've been appointing strong conservatives to our courts at every level. It is a record of success that is benefiting everyday Americans, creating jobs and opportunities. And yet it seems like there's a preoccupation by some in the media -- not all -- to always focus on the negative or always focus on criticism. EPSHTEYN: Here’s the bottom line: The Trump administration has to focus on continuing to achieve success for the American people. And that way, the results will speak for themselves. It is then the responsibility of the press to report the facts to people at home. This is the latest entry in Sinclair’s conservative programming playbook , which mirrors  former CEO Roger Ailes’ propaganda strategy  at Fox News for decades -- to convince the audience that one conservative outlet is the only source they can trust for news. Sinclair’s message is particularly dangerous because of the company’s numerous direct ties  to the Trump administration and its ability to reach unsuspecting local news viewers across the country by co-opting the trustworthiness of actual local reporters . In one extreme example , this spring, Sinclair required local anchors at its news stations to narrate promotional segments  decrying “biased and false news” in Trumpian terms.